Above L to R: Niki, Eszti, DezsÅ‘ and Roger. Our opening discussion question asked “How do you spend your quite time with God.” Niki encouraged us as she talked about having a prayer bulletin board in her room and sought to meet with God each morning. She keeps the bulletin board right by her bed so it is the first thing she sees in the morning. Niki also shared about lessons God was teaching her about stewardship and the use of her time. She was personally convicted about her ‘occupation’ with make-up in the morning and how much time it took away from more important things. She also saw how much money she was spending on make-up. Being free in Christ, she immediately made some changes to her daily routine. The choosing to spend less time with make up actually brings out a greater beauty of Christ’s work in Niki’s heart. Praise God for these visible steps toward maturity in Christ. 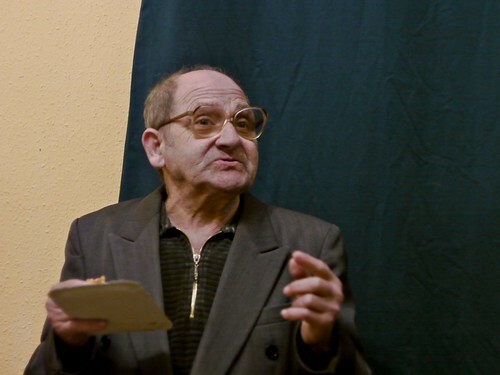 Above: We are so thankful for Gyula’s change of heart and his new found faith in Jesus Christ. I was able to give Gyula more information about baptism on Thursday night and invited him to our baptism/foundations of faith class on Sunday mornings. Through conversations with Gyula, it is clear that he is regularly in God’s word and is learning new truths about Jesus every week. Gyula, like the majority of those in our church, is the first in his family to believe. Praise God for his amazing work in Gyula’s life and the miraculous change that is taking place in Gyula’s heart. 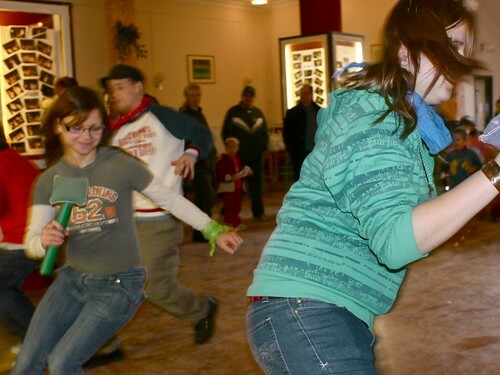 Above: Eszti’s daughter Alina and our Kira having some fun dancing at Játszóház. As our start time approached, we continued to glance at the doors, hoping for new families to respond to the invitations and posters that were distributed in Selyp/LÅ‘rinci. As many of you know, we have been looking for ways to begin a new work in this town for years, but the door remained shut. 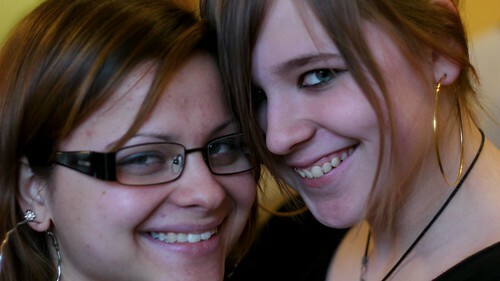 Unfortunately, there was only one family (Klári and her daughter Réka) outside of our team that attended. 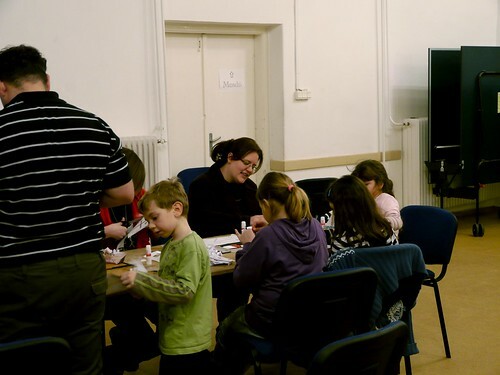 In contrast, in our home town which is half the size of Selyp, over forty kids and many parents attended. 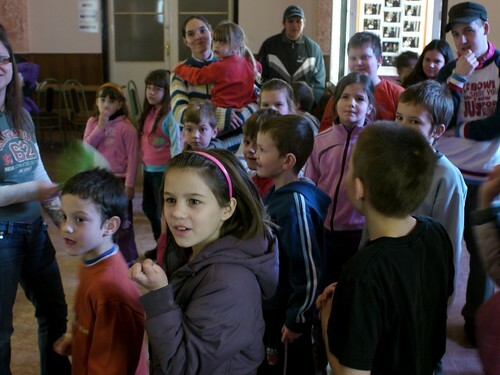 Miki already meets weekly with a lot of the kids from PetÅ‘fibánya to teach Bible class in public school. We also have relationships with parents through our Friday night volleyball outreach. We don’t have the same connections in Selyp, and we will be reconsidering our future steps of using Játszóház in this town. We have already begun discussing, moving this Játszóház to where God is clearly been signaling us... to the town of Heréd. Please pray that we would be led with His wisdom and use this tool where He wants to use it for His glory. Above: Klári and her daughter Réka. 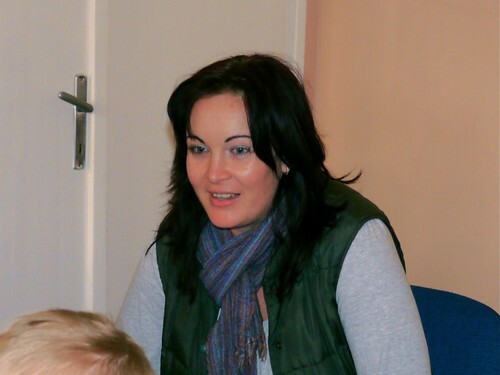 We are thankful for our continued relationship with Klári who we initially met through our ESL Bible study. 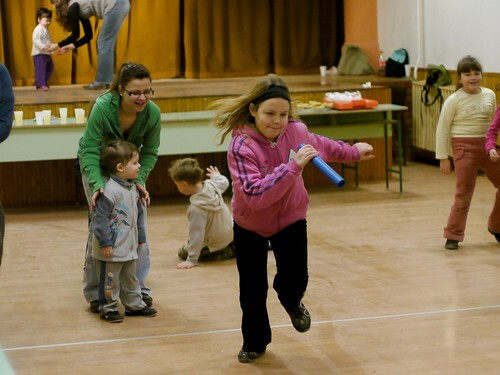 Above: Bence going after Gyula in one of our ice-breaker games for the kids. Above: Elianna and Anna helping with the motions to each song. 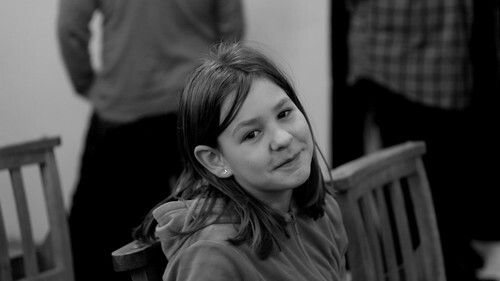 Above: Kira who had a stomach bug just a few days before fully recovered and was able to attend Játszóház. I couldn’t help but think of Jesus’ words in John 17: 22: The glory you gave to me I have given to them, that they may be one just as we are one - I in them and you in me - that they may be completely one, so that the world will know that you sent me, and you have loved them just as you have loved me. Our love for one another, our unity in Jesus is making a powerful impression on a man reaching his seventies. After music practice, I was able to talk to János about Jesus. 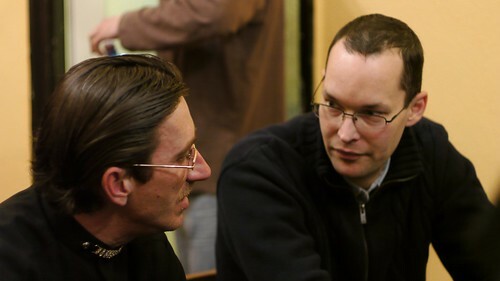 János comes from a Catholic background, but as I probed with questions, it was clear that he did not understand the good news that we can obtain salvation, forgiveness of sins, eternal life and a restored relationship with the Father through faith in Jesus Christ. He was of the mindset that we can’t be sure about what happens after death, and he spoke about God’s accepting people based on their good works. As I talked about sin and how we have all sinned and fallen short, János confidently said, “Not me. Not me.” Obviously, János needs not only to hear the Gospel, but understand the Gospel. We hope that as he continues to attend our church and as he eavesdrops as I teach Gyula in our baptism class that he will truly hear and understand and make a decision to believe Jesus. • Praise God that all of our kids are well and are able to return to school after weeks of sickness. 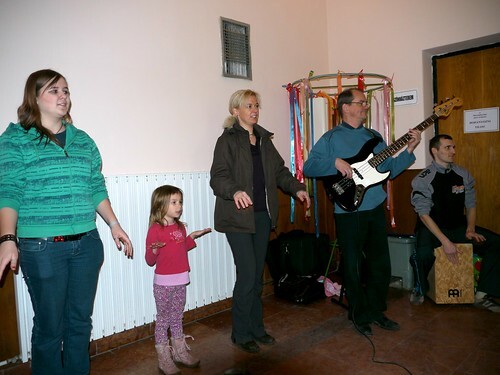 • Praise God for the continued spiritual growth of Gyula. • Praise God for the unity in our church and on our team which points to Jesus. • Pray for two teens. One a professing believer who is living in sin, another a regular attender and friend that is hardening their heart toward God’s work in their life. • Pray for Sharon as she meets with Ben and Elianna’s school principal to discuss our furlough plans and the many days our kids will miss. • Pray for our Thursday night teen mentoring meeting to encourage, equip and bless teenagers in their walk of faith with Jesus Christ. Verse 24 goes on to say, "Cornelius was expecting them and had called together his relatives and close friends." While this was going on in Cornelius' life, Peter had no idea about this opportunity. Peter did not first reach out to Cornelius, God did. I can't help but see the Holy Spirit's work in a similar way in the life of Marcsi, our new friend from the town of Heréd. Marcsi is not a believer, but has already (as I explained in my last blog post) called together families to "hear what we have to say". "I would like to organize a mini-conference entitled, "Family and faith" in March… Would you be willing to be the speakers? The invitations will be more wide spread and we can expect a larger crowd this time." What is God up to in Heréd? We are excited to join Him in it whatever it is! What is Farsang? It is kind of a like halloween without the asking for candy. In short, kids get to dress up in costumes and have some fun. 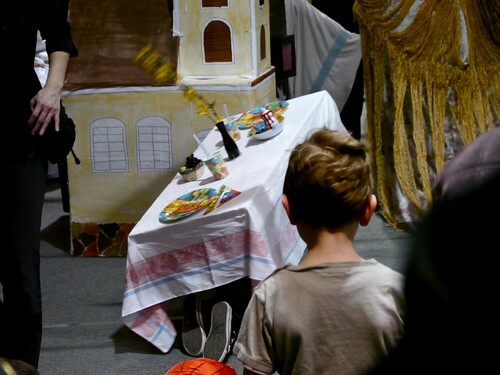 Above: Teammate Miki’s daughter Anna had a creative costume: A table. She won first place. Above: Elianna gets honorable mention for her costume: A Christmas tree. Too bad you can’t see her feet in the pictures which were made to look like gifts under the tree. 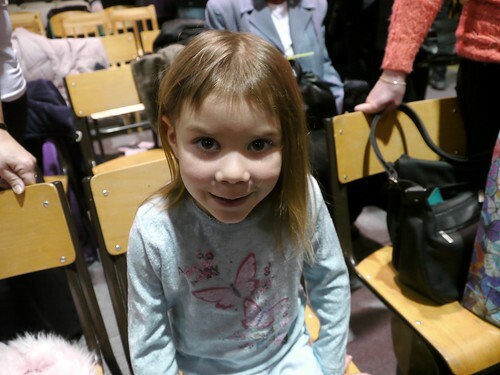 Above: Our youngest, Kira tagged along to see the show at Elianna’s school. Although Ben attends the same school as Anna and Elianna, he was stuck at home as he continues to battle through the flu. 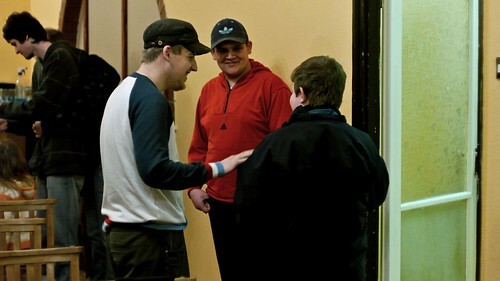 Above: We continue to focus on mentoring these young teens who are young in their faith and also use this night to reach out to teens like Dávid (far right) who have not yet made decisions. Above: Bianka who comes alone and on her own initiative most Sundays. Many kids in our town freely rome through our village without many boundaries established by their parents. 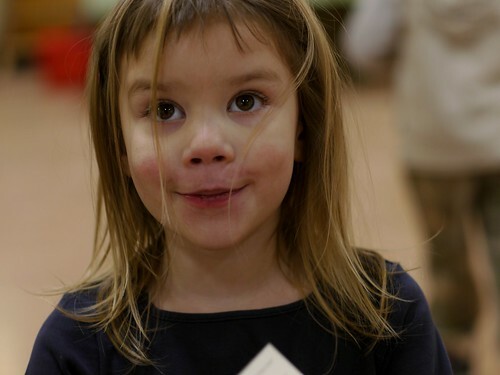 Bianka has come to our Children’s Outreach events on Saturdays and is a regular attender of our church. Maybe someday her parents will join her. Above: Back row filling up with more visitors from the town of Jászfényszaru (20 minute drive). God is using our body to strengthen new believers from that area and we are excited to see how we might be used to assist in church planting in Jászfényszaru. 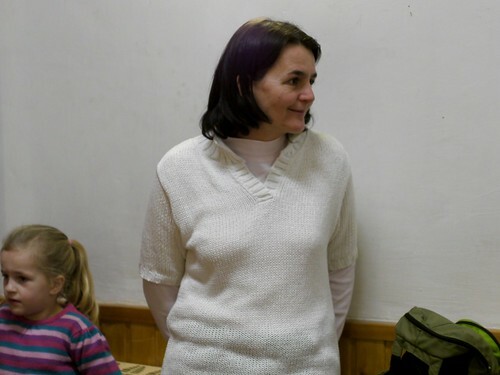 Above: Church members Eszti (mother of 4) and teenager Niki. Last year Eszti completed an extension course in Christian education and is teaching children’s Sunday School once a month. She taught tonight and said God continues to give her creative ideas on how to present various truths from God’s word. Praise God for building up members of His body and using their gifts to build His church. Before service on Sunday, Teenager Niki shared that she had personally invited Dávid to come to worship with us. Dávid has attended a few of our English Camps, our VBS every year and he now attends our Thursday teen mentoring meetings. In response to Niki's invitation, Dávid said that his mother wasn't so keen on the idea, but Niki pressed on and said, "You don't know if you don't ask… go ask her." At that moment, Dávid put Niki on hold on the phone and went off to ask. Niki said, "In that moment, I just started praying and praying that God would work in his mother and allow Dávid to come." Dávid came back with the good news that he was able to come! Above: Dávid comes to church for the first time. Dávid has heard the gospel preached multiple times, and tonight was no different. God had led me (Allen) to begin my message with an overview of the Gospel before I went into the text we would study the rest of the night. I encouraged all who hadn't made the decision to put their faith in Jesus to no longer hesitate or ignore this amazing gift that God has offered. 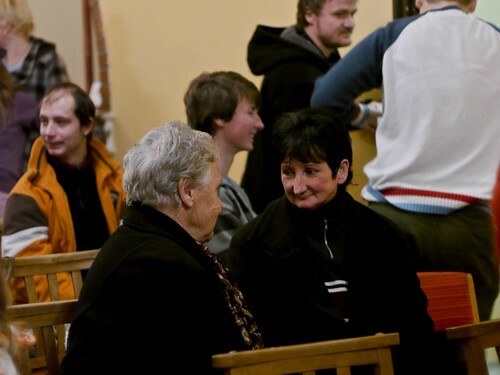 After worship service, Dávid began talking with Miki. He shared that even though he has a lot of friends, he still has a sense of being alone in the world. Miki challenged him and asked, "You know what the problem is don't you…" Dávid said, "Yes". Dávid knows that Jesus is the answer and seems to be even closer to putting his faith in Jesus Christ. God is gracious in bombarding Dávid with His truth that sets us free. MIki was able to give him a book that goes through the claims of Jesus Christ and ends with an explanation of what to do to be saved by Christ. Please pray for Dávid in this time of seeking that He would personally encounter the Resurrected Christ and call on him for salvation. 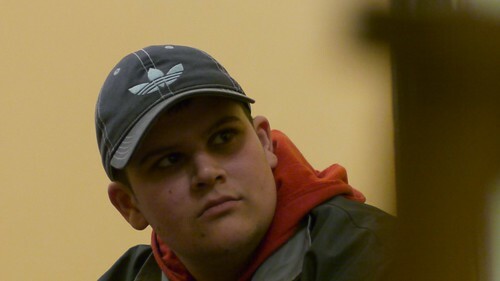 Above: Gyula on Thursday (with baseball cap). 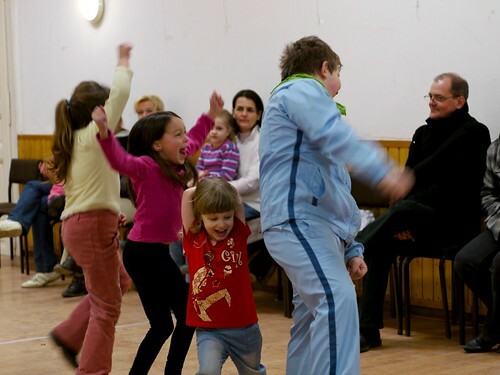 I’ve been sharing over the past few weeks about the changes in Gyula's life. As I commented before, his first response to Christ was a clear, "Not interested". Over the past months that demeanor has changed and he is clearly seeking. Miki shared with me that he had a conversation with Gyula about where he was on his journey. 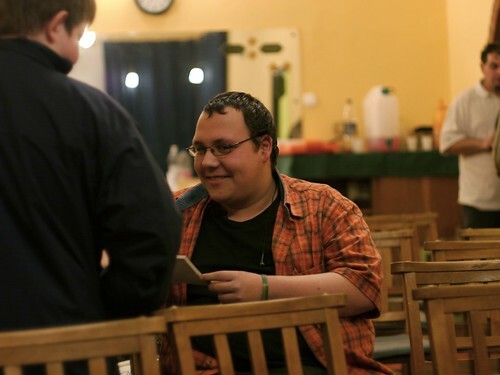 Gyula told Miki that he had put his faith in Jesus and has noticed a change in his life. Praise God for this profession of faith and may Jesus transform this young man through the power of His Holy Spirit. I have given Gyula more information on baptism and look forward to talking to him more about the decision to become a follower of Jesus in our Thursday night teen mentoring group. 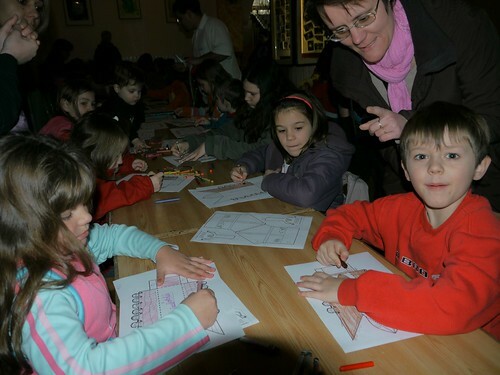 This is the second week an elderly man named János came to our service. He found our church two weeks ago by 'accident' as he was walking and heard our songs of worship which drew him in. János said that the whole week he was looking forward to seeing us again. 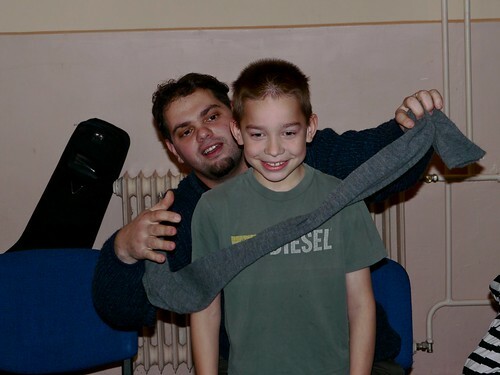 Miki was able to give him a Bible after worship service and János seemed eager to begin reading it. May the Lord draw this elderly man to himself that he may also become a worshiper of the one true God through Jesus Christ. 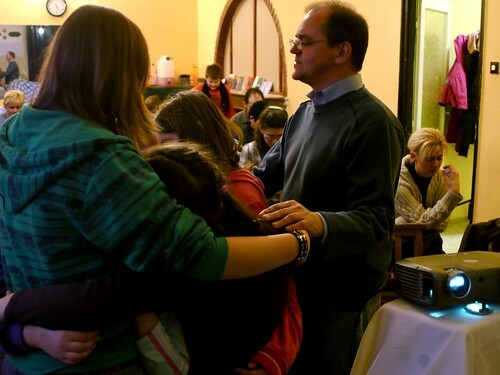 Thank you all for your prayers and support that equip us to continue serving in Hungary. This has been a very encouraging week as we see the Spirit of God transforming people’s lives. • Praise God for the response of Marcsi and the invite for us to come back to teach about family and faith. • Praise God for helping Allen with sermon preparation and communicating the truths God laid on his heart. • Praise God for Dávid coming to church and indications of him seeking. Please pray for God to speak to Him through His word. Pray that He would understand what He needs to do to be saved and have a restored relationship with God. 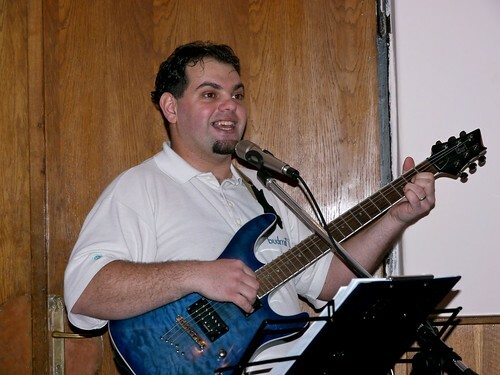 • Praise God for Gyula’s profession of faith. Pray that Gyula would grow in Christ as he continues to read God’s word. • Pray for Ben who is still coughing and feverish. 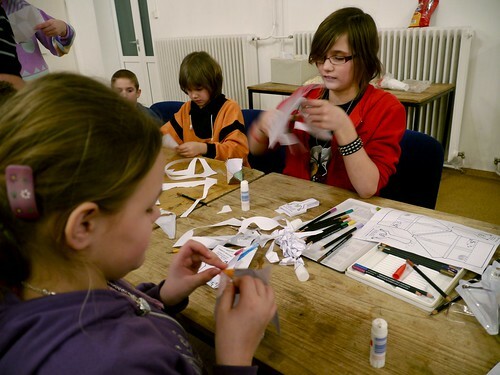 • Pray for Thursday’s Teen Mentoring meeting and Saturday’s Children’s Outreach in the neighboring town of Selyp (shape). 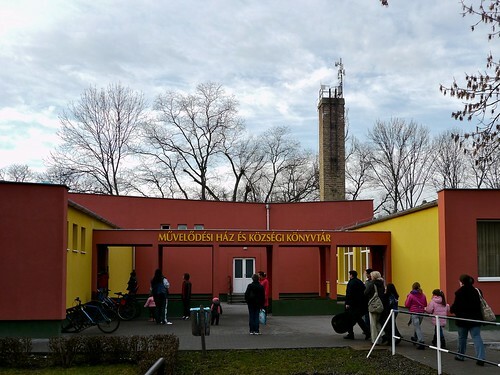 Above: Heréd’s local community center. Last night we had the opportunity to hold a evangelistic Bible study in the town of Heréd’s local community center. 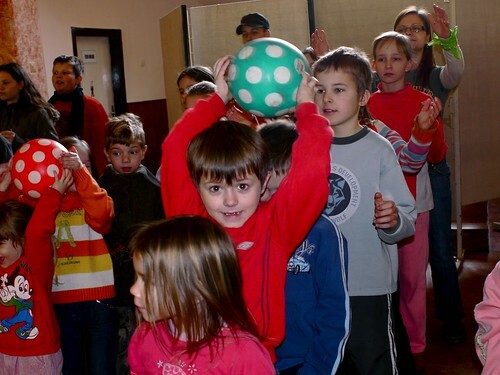 Apparently the organizer expected more parents to show, but said that the cold winter months and the current rapid spread of influenza throughout Hungary has brought down attendance. We were just happy to share with whoever showed up. Above: Meet Marcsi, the one who initiated tonight’s meeting. Marcsi’s daughters have seen our puppet shows in their public school over the past years and have also attended our VBS. Marcsi has been organizing events for families in her town over the past year and seeks to build opportunities for fellowship. We pray that these meetings will lead to her understanding how to gain a restored relationship with God through faith in Jesus Christ. Above: This is another Marcsi who also attended. Both of these women stayed for the small group discussion that DezsÅ‘ led, while another parent was in a separate room to help her young children in the children’s program we organized. 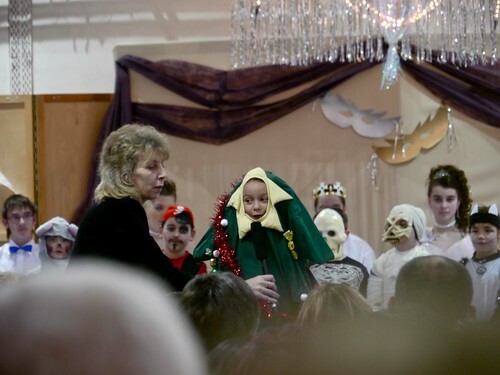 Above: This child was just too fearful to join the others in the children’s program. After stepping in and out multiple times, he asked his mother if they could go home. His sister who was also there actually was committed to stay, but in the end the family chose to leave. Thankfully, the other kids, although initially reserved (since they don’t really know any of us) warmed up quickly and had a great time. Above: Ben volunteering as a test subject for the next game for the kids. 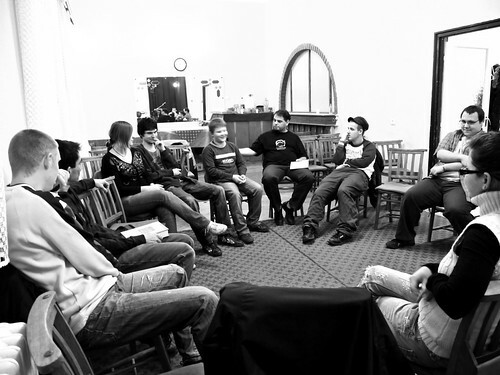 Above: DezsÅ‘ leading the small group discussion. Although I was not in the room (since I was helping entertain a wild kid the whole night in the other room), DezsÅ‘ reported that the discussion went well and served as a great building block to continue. Both Marcsi(s) were receptive and interacted in the discussion. Praise God for this ‘first step’ into this community and for God’s grace in opening this door to share His good news with families in Heréd. Thank you all for joining us in this ministry through your faithful prayer and financial support! • Praise God Sharon and Elianna are almost fully recovered from the flu. • Please pray for Ben who is showing signs of the flu today (fever and aches). • Please pray for more opportunities to continue evangelistic Bible studies in Heréd through Marcsi. Pray for both Marcsi(s) to consider what they heard last night and to be drawn to Jesus. • Please pray for teenager Gyula who is beginning to seek, read his Bible and is asking questions about baptism. • Please pray for Thursday night’s youth mentoring meeting. • Please pray for Allen who will be preaching on Sunday. Above: We continue to rent out the local middle school’s gym for volleyball every Friday night. This is a great way to continue friendships with people like Timi (yellow) who’s children regularly attend Miki’s Bible classes in school and our summer VBS every year. 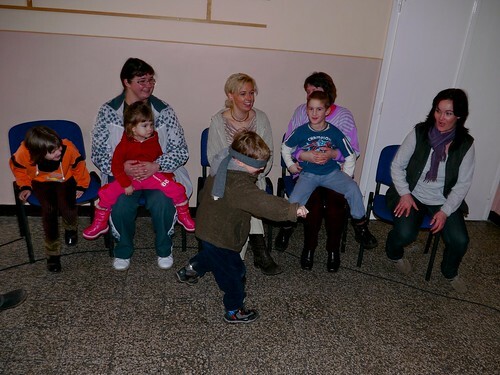 Getting together on Friday night also gave us another opportunity to invite families to our Saturday “Játszóház” Children’s Outreach. Above: Timi (pink scarf) helping her son with Saturday’s craft. We praise God that around 35 kids attended, many of whom also regularly attend Miki’s Bible classes in school. For some of the teens in our church who are now baptized believers (and helped serve with us today), this was their first exposure to the Gospel many years ago. 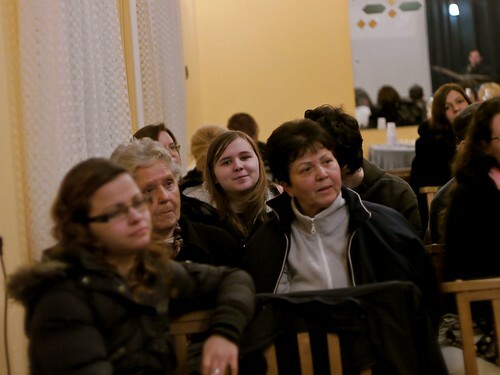 We hope that the seeds of the Gospel that we continue to sow through Bible club and these Saturday Outreaches will take root in a new generation of Hungarians. Above: Church member Eszti teaching Saturday’s memory verse. 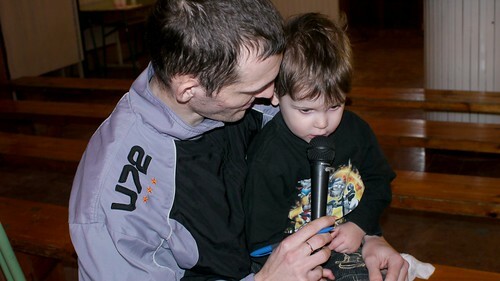 Above: Eszti’s husband Peti (with his son Dáriusz) organized the games for today’s outreach. 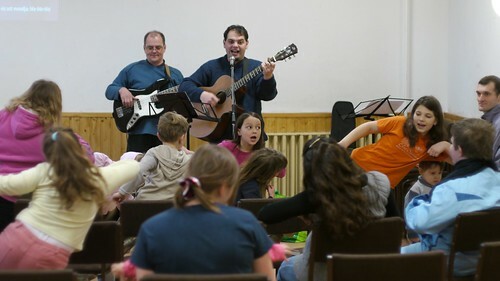 Above: Miki leading some fun songs with the kids that also teach important truths about God. 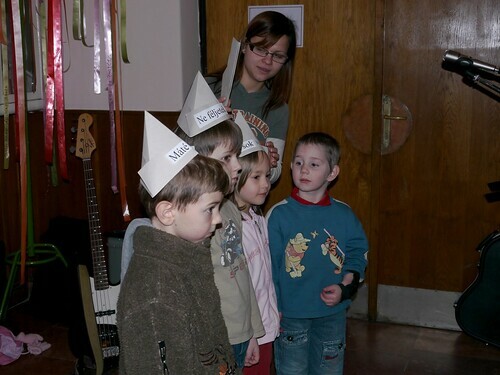 Niki, Kira and Erika helped the kids by showing various motions to the songs. 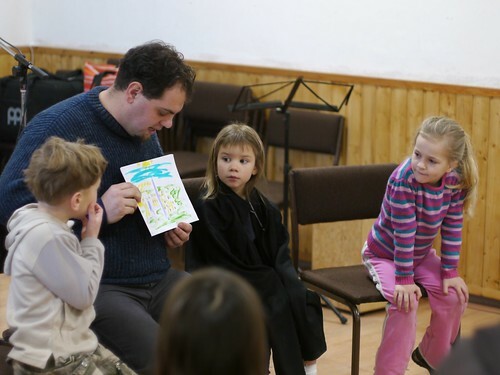 Above: As is our custom, DezsÅ‘ prays for the children before then go to a separate room for Sunday School. Above L to R: Jozsi, Levente and GyÅ‘zÅ‘ catching up before service. Jozsi and Leventi are from the town of Jászfényszaru (half an hour drive away). Almost half of our seats on Sunday were filled with others who also commuted to join us from Jászfényszaru. Jánós, who is mature in his faith, has led many of them to Jesus, and currently leads a Bible study in their small town. It seems as if God is using our local body to build these new believers up and encourage others to pursue the callings God is giving them as followers of Jesus. One from Jászfényszaru shared with me, “I dream of having a church like this in Jászfényszaru! I’m praying and hoping that God would send someone to do it.” I then replied, “Why not you?” I then shared the story of church member DezsÅ‘’s journey from becoming a Christian years ago to now serving as a teaching pastor in our body. I look forward to seeing what our small part will be in helping this growing body in Jászfényszaru plant a church. Praise God for his sovereignty in bringing us together! Above: God continues to soften Gyula’s heart (baseball cap above). Gyula has been attending our Thursday night youth mentoring meeting and also church every Sunday. He admits that when he first came to know us, he wasn’t very interested in God but has since changed. In Thursday night’s meeting, when the teens were asked what they were ‘up to’ last week, Gyula replied, “I’ve been reading the Bible and studying English.” After worship service on Sunday, Gyula came to me and began asking about Baptism. This gave me an opportunity to share the Gospel and challenge him to consider the claims of Jesus and to make a decision to put his faith in Him. Praise God for continuing to draw Gyula to HImself! Please pray for our team as we travel to the small town of Heréd tomorrow. 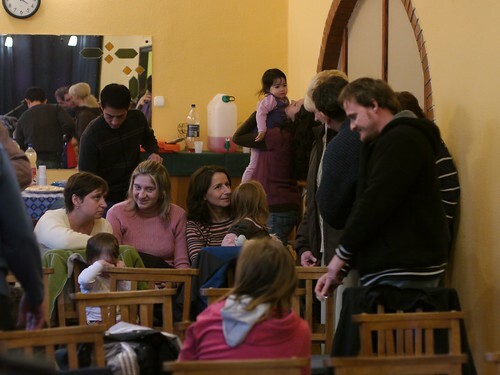 God has opened a door for us to share the Gospel with a network of families that had seen our concert and crafts in a previous community event in Heréd. We have also visited this town twice a year with our Evangelistic puppet show in their public school. We have an amazing opportunity to hold a small group discussion/study that has been organized by a parent from this town. Please pray for God’s Spirit to open their eyes to God’s truth and to draw them all to Jesus Christ, the Savior. 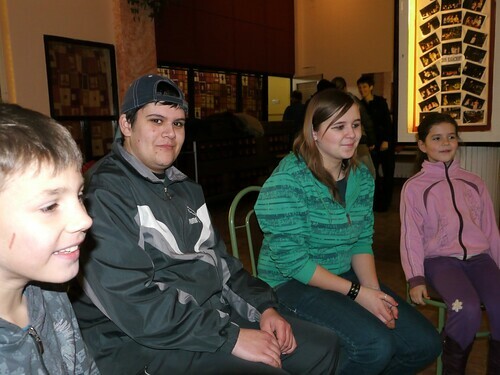 From Friday to Sunday morning, we attended a conference in Debrecen with teens from our church. 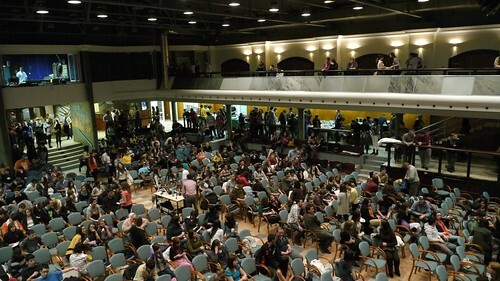 There were over 600 teens who traveled from all over Hungary to attend. Above: Morning ‘warm up’ where we stretched in unison. Attila (above right) obviously is no longer a teen, but the messages he heard this weekend were also for him! The two pastors who taught throughout the conference focused on calling attendees to a decision to follow Christ and to begin living with full commitment. Jesus rebuked some of his followers in the book of Revelation, 3:15 “I know all the things you do, that you are neither hot nor cold. I wish that you were one or the other! (NLT). I was very thankful for the teaching this week and for the eight teens we were able to bring from three different towns that attend our church. 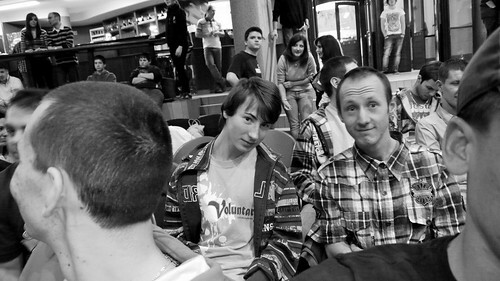 Above: Brothers Levente and Jozsi who are from Jászfényszaru also attended with us. 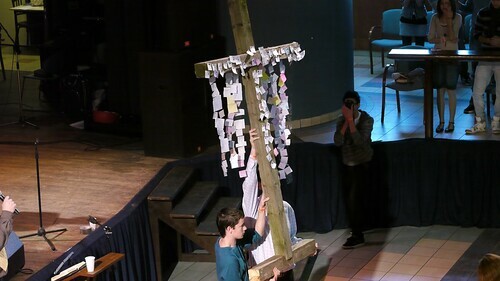 Above: After preaching on the call of Isaiah on Sunday, the pastor made a call to the 600 teens, “Whom shall I send, who will go!” Those who wanted to make new commitments or renew their commitments to follow Jesus came forward and wrote their name on papers that were attached to a cross. 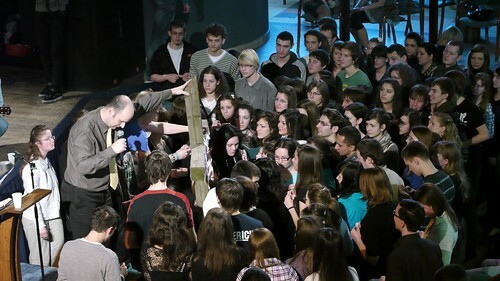 I praise God for seeing a crowd of teens respond in their recognition of Christ being worthy. Jozsi was one in the crowd writing his name. May the Lord equip them all and bless them. May they all bring glory to Jesus Christ as they follow Him and fulfill their calling through Him. I shared in last week’s blog post the sadness in my heart for two in our church that were on a path of rejecting Jesus as their Lord in their decisions and behavior. Thankfully, one of the two has since repented and been restored! Praise God! Though this trial was ‘only’ a week long, it has caused damage and consequences for the one involved. Please pray that this one who has returned and been cleansed by Jesus would have a deeper understanding of God’s grace and walk in a way (through God’s grace) that does not bring shame to the name of our Lord. The other one who is choosing to wander off is in need of prayer. This person is making decisions based on feelings and passions of the flesh, not on the sound foundation of the Father’s word to His children. Please pray that the Spirit of God would use recent conversations, and recent messages that this person has heard to bring him ‘home’. Pray for conviction of sin, a realization of which path they are on, and that God would give them wisdom to understand that His way is always the best way. ABOVE: We began Thursday night by meditated on various verses from Psalm 119 in small groups. Our goal was to continue to teach the teens about prayer as we looked at the Psalmist’s example. 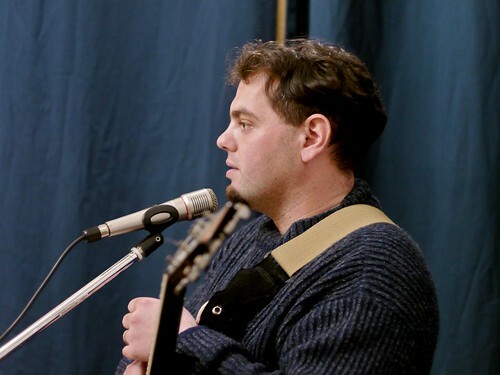 Afterwards, we integrated musical worship and gave the teens an opportunity to put into practice what they were learning by praying between each song with thanksgiving for who He is. Afterwards we discussed the contrast between a worldly life void of the Spirit of God and the life of one submitted to Jesus Christ. Above: Guest pastor and long time friend Jonatán (right) from the town of Gyöngyös preached in our service on Sunday. Unfortunately, our county is plagued with generational fighting in families, in politics, in the communities. Jonatán encouraged the body to be peace makers and was very effective in giving practical examples of how our calling plays out in everyday life. Just before going into our time of small group prayer for our community, Miki asked to see a show of hands for people from PetÅ‘fibánya, from LÅ‘rinci, from Rozsaszentmárton and from Jászfénszaru. It was very encouraging to see the number of hands go up from each place. God is ministering to four towns through this local church and we seek to equip members to plant more churches. Praise Jesus Christ who is causing growth not only in number but growth in member’s maturity through discipleship. Above: Sure, Ben only got to play about 1 minute in the tournament on Thursday, but he had a great time. Ben’s school came in fifth place out of eight teams. I think someone needs to wash his uniform in extra boiling hot water to shrink it. - Pray for the one who has repented and been restored in our church to be strengthened in fellowship, grow in His faith and to “walk in a manner worthy of the calling to which [they] have been called.” Eph 4:1. - Pray for our Thursday night youth mentoring meeting. Pray for the teens to mature in their faith in Christ and to bear fruit in accordance to what they are learning from God’s word. 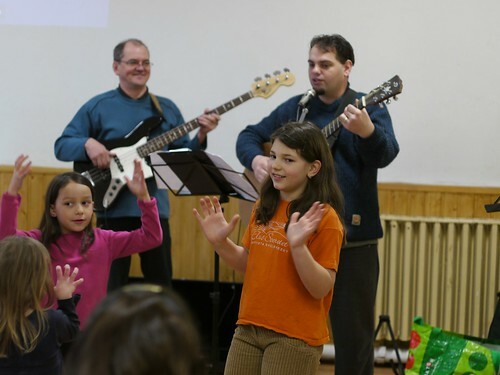 - Pray for our Childrens Ministry Outreach (Játszóház in Hungarian) that we will be holding this Saturday in PetÅ‘fibánya. Pray for new families to attend, for the Gospel to be clearly communicated and for new relationships with families in the community.